For collectors who wish to begin a collection, there are lots of buttons to be had. Frequently, old metal tins (probably used for sewing boxes) chock full of buttons can be found in thrift shops, at flea markets or yard sales. The majority of the contents are ordinary buttons that have been snipped from clothing prior to being discarded. This is not a huge investment, however, and worth a purchase. Many times there are unique examples or, most likely, just cute buttons to add to a craft project. Many time you can find buttons still attached to their display cards. Keep these cards, as they offer valuable information about the manufacturer. Obviously these buttons were, at some time, sewn on this card, which is labeled "Styled Dress Buckle"
When I travel I usually look for handcrafted buttons in fabric shops or shops selling trims and passementeries. Easy to pack and lightweight, they are useful souvenirs, I do not need any more tee shirts!! The Island Craft LTD. buttons on the lower left are made of coconut and are from the Cook Islands.Coconut shell buttons are sometimes found in fanciful shapes and were made strictly for the tourist trade in tropical locations. Similar-looking buttons are now mostly made from plastic or wood. As your collection grows, and it will, believe me, there are many references available on button identification as well as groups of collectors willing to share button news. 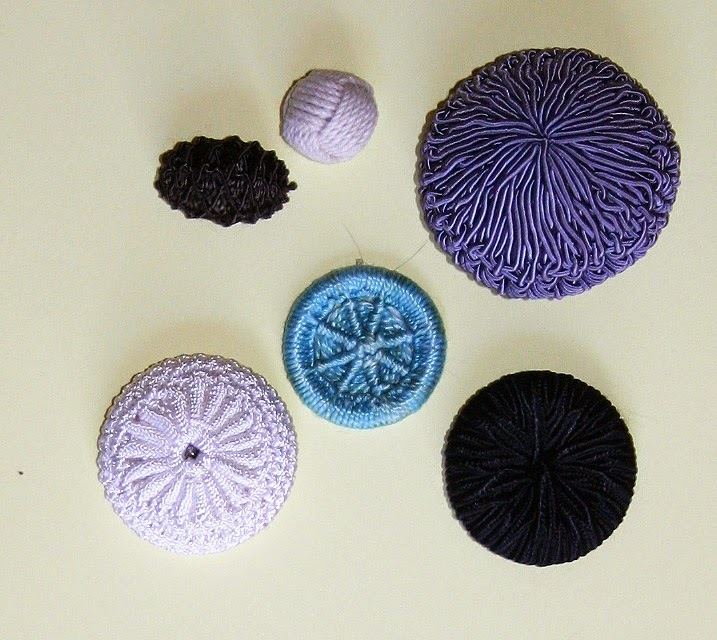 For those who wish to use decorative buttons in textile arts or to adorn a hand-knit sweater, modern buttons in every size, shape, color and material are available. I made the turquoise button in the center. The other buttons are vintage. Patterns and designs for needle craft buttons. Not all buttons have two holes! One-holed buttons are called "whistles". These are wooden. Did you know that there is a button phobia? Called Koumpounophobia, it is the irrational and persistent fear of buttons ( single buttons or those on clothing). The word is derived from Latin “Koumpouno” which means buttons ( or probably some type of disc fasteners or embellishments) and Greek “phobos” which, of course, means fear. A related condition is Trypophobia, which is the fear of round or circular objects or the fear of holes. According to the internet, nearly 1 in 75,000 people are known to experience Koumpounophobia and tend to avoid clothing with buttons.